Threats to Southeast Florida Coral Reefs - Politics, News, and Hypocrisy - Chickensomething What Are You Afraid Of? Healthy coral reefs support commercial and subsistence fisheries as well as jobs and businesses through tourism and recreation. Approximately half of all federally managed fisheries depend on coral reefs and related habitats for a portion of their life cycles. The National Marine Fisheries Service estimates the commercial value of U.S. fisheries from coral reefs is over $100 million. Runoff from residential, industrial, and agricultural areas containing fertilizers, silt, chemicals, debris, and other contaminants are carried through storm drains to Florida's waterways. Sewage discharges from waste treatment facilities, boats, and developed land areas contribute to coral diseases and death. Even treated sewage contains high nutrient levels which trigger algal blooms that smother reefs, and may also contain bacteria and viruses which threaten the health of both the marine environment and humans. Pollution from people who live many miles from the coast can destroy corals as liquids and solids eventually make their way downstream to the ocean through our numerous inland canals and waterways, and through groundwater transport. I see the run-off in the river. The sludge looks grim. Years and years people have been complaining of waste running down the rivers in America. Doing some research in my own state reveals much behind the curtain of politics we all face today. The great show on the major media hardly touches the real concerns facing the infrastructure of our country today. At least Trump implies rebuilding America. What does that mean exactly? All the worlds oceans have gotten filthier and filthier. Radiation is a big problem too. Humans sure do threaten a lot. Including each other. In 2008, about 50 images posted with a first-hand account of a visitor who had spent a few months in India, had gone viral in China. Many Chinese forums and columns published them. The images are disturbing, but not for the government and Indian people except some activists and NGOs. Surprisingly, the images depicting ugly side of India did improve sanitation condition in China. China has its own flaws, but it can’t be denied that Indian aren’t treating scared river as it should be. On the other hand, Indians don’t mind such embarrassment or they don’t actually know how India is perceived by rest of the world. India enjoys an image of ancient civilization with spiritual values. There is no country in the world like India when it comes to cultural and social diversity. 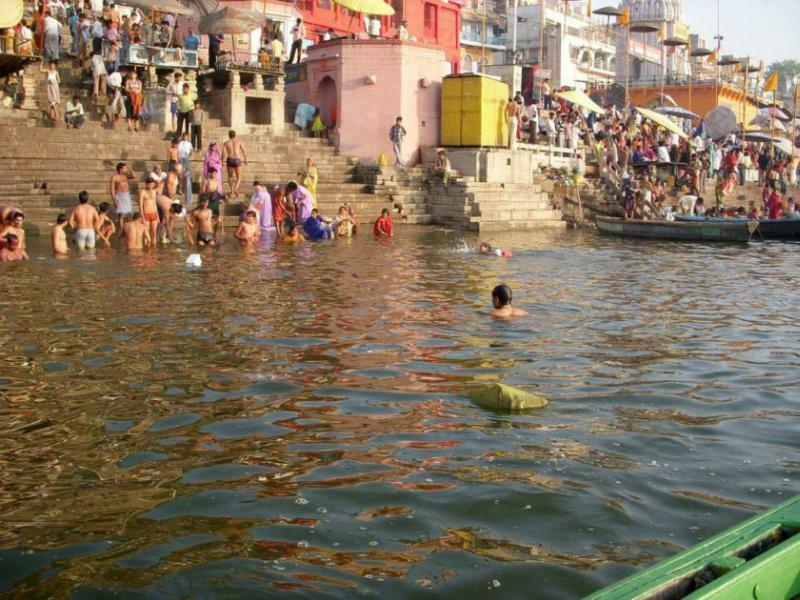 Tourist are nuts for places like Varanasi. Every state has something unique to offer to tourists. From Himalayas in the north to the costs in the south, from billion dollar buildings to poverty stricken slums, India makes a perfect destination for those who seek exposure to world’s biggest and successful democracy. Can't fish, can't swim, even canoes in the river are hazardous. Absolutely ridiculous. Who to blame, who to blame? Can't really blame the public. People in general don't pollute the rivers and oceans. A few of us piss in it occasionally but that's about it. We all know where the blame lies. Only the entities involved are immaculately insulated in legal jargon layers thick and miles wide. Too bad! Most people know enough not to throw things in the river.